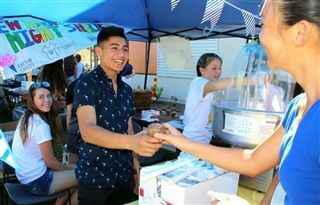 Pacific Ridge families and friends braved the heat on Saturday, October 10th to support student service learning groups and clubs while celebrating the changing seasons. Attendees enjoyed perennial Fall Fest favorites such as the bake sale, faculty dunk tank, musical performances, and the silent auction; all while learning about, and contributing to, worthwhile causes. Thank you to all of the hard-working volunteers, students and staff who continue to make Fall Fest a cherished community event.